Glomus tumour is an uncommon true benign tumour arising from contractile glomus cells that are present in the arteriovenous shunts (sucquet-hoyer anastomosis). These tumours are found most often in the dermis of the fingers or toes under a nail; other sites are mucosa of the stomach and nasal cavity. These lesions are characterised by extreme pain. They may be single or multiple, small, often less than 1 cm in diameter, flat or slightly elevated, red- blue and painful nodule. Glomus jugulare tumour or jugulare paraganglioma or non- chromaffin paraganglioma is tumour originating from parasympathetic ganglia are called paraganglioma and are named according to the location of the tissue of origin. It basically originated in the temporal bone of skull further it involves middle ear and internal ear structures. 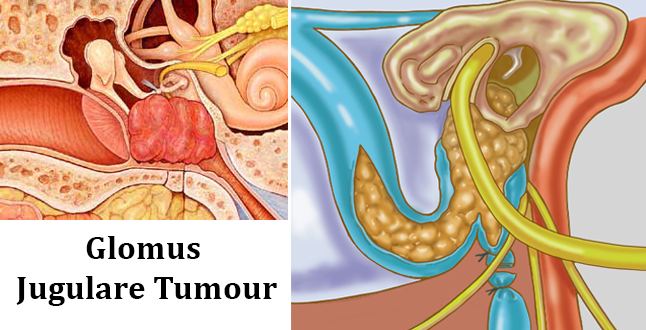 Major tumour arising from glomus jugulare bodies in the middle ear (jugulotympanic bodies) is called jugular paraganglioma or chemodectoma or non-chromaffin paraganglioma and is the most common benign tumour of the middle ear. Histologically similar tumours are seen in the carotid bodies and vagus. Microscopically tumours cells containing neuro-secretory granules are arranged in typical organoid pattern or nests. The tumour may extend locally to involve the skull and brain but may rarely metastasise. Other organs that are affected by this tumour are base of skull, upper neck and surrounding nerves and blood vessels. According to Ayurveda, this disorder is categorized under granthiroga. All three doshas are responsible for causing this disorder. According to rules of Ayurveda increased levels of tridosha are the major factor for causing granthiroga. According to above mention verse of Shushrut Nidaansthan mentioned in Madhav nidana aggravation of tridosha in body affects rakta, medha, masa dhatu and infected blood is carried by vessels results in the formation of round, raised and complicated mass like formation in any part of body is called garanthiroga. In the same when all these infected factors accumulated in temporal bone of skull, results in the formation of glomusjugulare tumour. Further it affects middle ear and surrounding nerves and vessels. The Madhav nidana with elaborated Sanskrit commentary of Vijyaraksita and Srikantha datta and edited with Hindi notes by Dr. Brahmanand tripathi: edition 2005 page number- 86 and verse number 11. Due to involvement of dosha and dhatus garanthiroga is divided into 5 subtypes- vatajgaranthi, pittajgaranthi, kaphagranthi, medhojgaranthi and sirajgaranthi. Vishamaharavihara (unhealthy eating and lifestyle habits) are the major causes that are responsible for causing this disorder. This factor cause disturbed tridosha and creates obstruction in skull and finally forms tumours (garanthi in mastishka). Glomustumors are not always cancerous in nature and usually they do not spread in other body organs. Surgery and numerous modern medicines are available in market to treat this disorder. But herbs are only way to treat this serious problem naturally without any Side effects. Herbal treatment is natural and safe way to reduce the symptoms of this disorder and treat is wonderfully. Planet Ayurveda brings you various beneficial herbs for treating this disorder in form of crab care pack. This pack contains six miraculous supplements that treat this problem naturally. Ashwagandha is only herb which is used to prepare this wonderful supplement. It is very beneficial herb that works wonderfully against the cells and factors that contributes to grow glomus jugulare tumour. Its anti-oxidant nature fights against tumour cells and protect organs from the risk of cancerous cells. It also supports our blood vessels and helps to maintain proper flow of blood in body. This herb also helps to stimulate our immune system and gives energy to body cells to fight against various infections. Dosage :- 2 capsules twice daily after meals with plain water. As we all know that inflammation is the main reason that may leads to internal growth of cancerous cells in body organs. Turmeric is beneficial, safe and effective herb that is used to prepare this herbal supplement. Its anti-oxidant nature helps to reduce the inflammation of internal organs and protect body cells from these toxic growths. Curcumin is a bioactive substance present in this herb that inhibits the growth of tumour cells. Various different herbs, salts and minerals are used to prepare this wonderful formulation. It is also very effective herbal remedy for glomusjugulare tumour because its helps to reduce the underlying symptoms of this disorder naturally. It is also good for circulatory system and it reduces excessive inflammation over infected areas. It is also effective herbal formulation for reproductive and urinary system. It also helps to fight against various urinary tract infections. It is good for women reproductive system as it helps to shrink ovarian cysts and treat fibroids naturally. Dosage :- 2-3 tablets twice a day with plain water after meals. Tulsi is major herb use to prepare this herbal formulation. Tulsi is very effective herb that fights against cancer and tumour cells. It is a good nervine tonic that is used to treat various brain related problems. It also fights against infections and internal inflammation in body. It is also very effective remedy for respiratory and nervous system. It fights against various infectious cells that cause serious infections in different parts of body. Standardized extract of pure guggul is used to prepare this herbal formulation. This beneficial supplement is used to balance doshas and dhatus in the body. It supports healthy metabolism and circulatory system in the body. It is good to reduce inflammation and helps to maintain the normal molecular level of body cells. Kanchnaar bark, triphala, ginger, black pepper, pippali and varun are the various effective ingredients used to prepare this wonderful herbal formulation available at house of Planet Ayurveda. Kanchnaar is very effective herb used to reduce inflammation of lymph nodes and it helps to clear blocked channels of circulatory and lymphatic system. kanchnaar bark is also helps to inhibit the grow of cancer cells in the body and it helps to reduce inflammation and extra growth over infected areas of tumour. It is a natural detoxifier that helps to remove toxins and protects the body cells from risk of various different disorders. Dosage :- 2 tablets twice daily with plain water after meals. 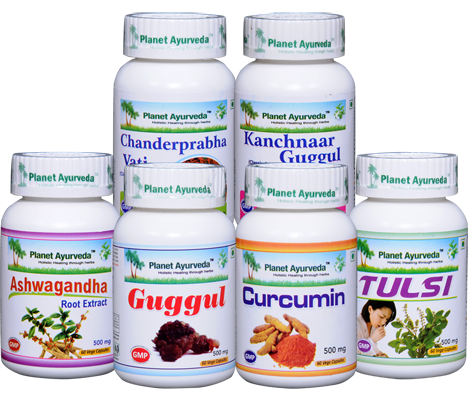 All the above mentioned herbal formulations are available at Planet Ayurveda and are prepared by pure, vegetarian and 100% natural herbs. All these herbs help to maintain proper balance of three doshas in the body. No colours, binders, preservatives, starch, gelatine and chemicals are added to these herbal formulations. 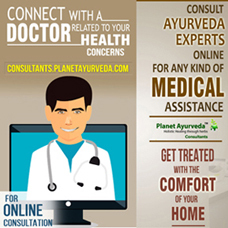 All the products are safe, have no side effects and are formulated by MD doctors. It supports our organs and molecular levels of cells naturally.